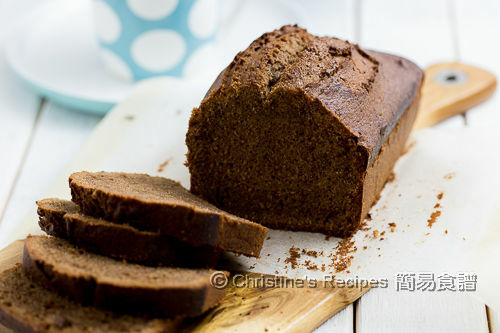 Chocolate pound cake is so easy to whip up as an after-work or after-school snack. The deep chocolate flavor will be intensified more if you manage to make it in advance. The attractiveness of chocolate is irresistible. 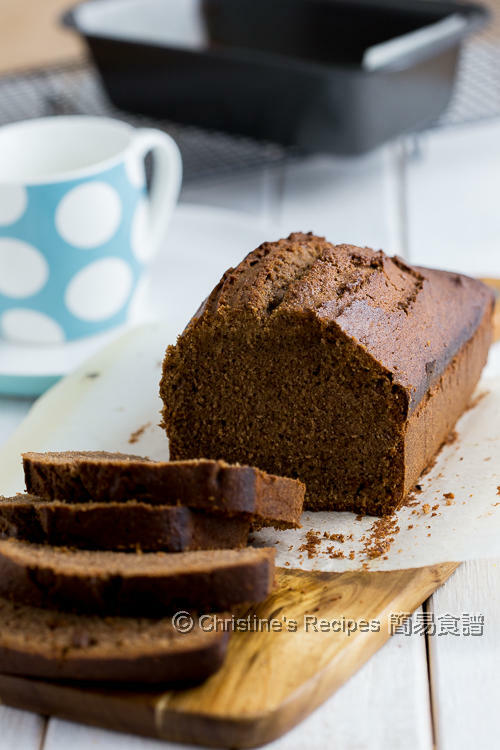 As simple as this pound cake, a little bit of cocoa will intrigue your family and friends to want more. You can make this chocolate cake well in advance. The chocolatey taste will be intensified more. As Mother’s day is coming around the corner, it won’t be wrong to make one for your family, or yourself. Brew a cup of hot tea with a slice of this rich, buttery chocolate pound cake. It’ll make a day for your mother. Get all the ingredients ready. You'll be good to go. The chocolatey flavour of your cake depends on the quality of cocoa powder you use. Preheat oven to 180C / 350F. Mix the cocoa powder with hot water thoroughly until no lumps inside. Set aside. Combine and sift the cake flour, baking powder and salt. Beat the softened butter with an electric mixer at low speed. Add sugar and gradually increase speed to medium-high. Continue to beat until very pale and creamy. Scrape down the sides of the bowl occasionally. Mix in the eggs one by one. Combine completely between each addition. Stir in the cocoa mixture and vanilla extract. Sift in the flour mixture in 3 batches. Stir in the milk in 2 batches after each addition of the flour mixture. With a spatula, lightly combine all the ingredients. Make sure not to over-mix it as you don’t want your cake turns tough. 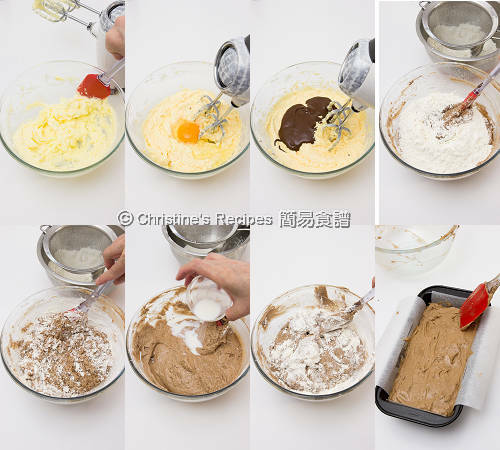 Transfer the batter into the lined cake mould. Level the surface with spatula or the back of a spoon. Bake in the preheated oven for 60 minutes. If an inserted needle comes out clean, it’s cooked. Remove the cake from oven and rest for 5 minutes. Remove from the mould. Let it cool completely on a wire rack. Enjoy! You may briefly whisk the egg before adding into the butter mixture in 3 batches. 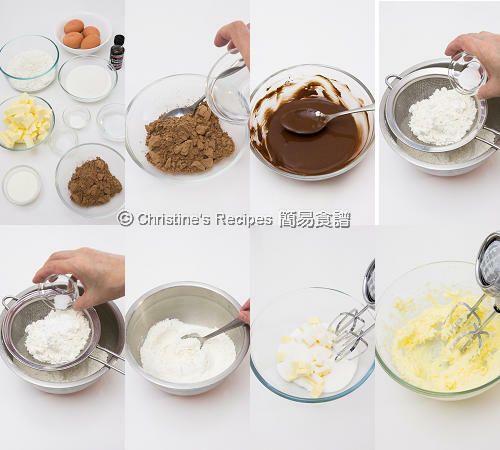 Cake flour is a kind of low-protein flour, available at Asian grocers or bakery shops. The water absorption rate of flour is very different from brand to brand. You may adjust the batter consistency by adding a little bit of water/milk if it’s too dry, or adding a bit of flour if it’s too moist. If the surface of your cake turns brown too quickly, loosely place a foil on top. If you like to have a straight-line crack running beautifully on the cake surface, use a knife to score a line on the batter surface after baking 10 minutes. I am having some tea now :-) This would be a nice accompaniment, Christine. Looks yummy. Cant wait to make it. Happy Mother's Day! Thank you for recipe. I love chocolate, who doesn't? Can we use plain flour instead of cake flour? Yes, you can use plain flour. 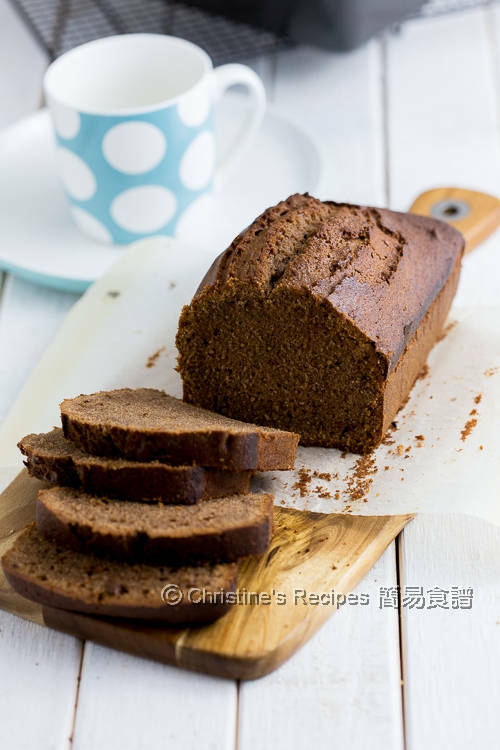 If using cake flour, the texture of cake is softer. Can I substitute cocoa powder with dark cooking chocolate Bar, f so, how much quality? You can use 2 tablespoons of cocoa powder, or more if you like stronger, dissolved in some hot water. It's ok. This recipe is quite forgiving. Just in case, if you find the batter too runny, add a bit of flour to adjust the consistency. It can be turned in cup cakes although I haven't tried. Feel free to experiment and adjust the baking time.